Plays on table during seed phase. Door is now open, allowing your cards to enter play. OR Stock in deck and use as follows: Plays to nullily one Revolving Door or Subspace Schism. (Discard doorway.) OR Allows one ship to pass through Q-Net. (Discard Doorway). OR Nullify one Temporal Rift, and return doorway to your hand. A seeded copy of this doorway allows your -icon cards to enter play. See Alternate Universe icon. You may not play or download this doorway to the table for this purpose. You may play this doorway to nullify a Temporal Rift only during your own turn (unless downloaded by discarding a Space-Time Portal). This use is a card play that returns to your hand rather than discarding (not “showing a card”) and may be affected by Energy Vortex. There are 41 entries for Alternate Universe Door (ST1E 2 C 32) at the Tradeplace (313 haves and 0 wants). Click here to see all trade list entries for this Common card! 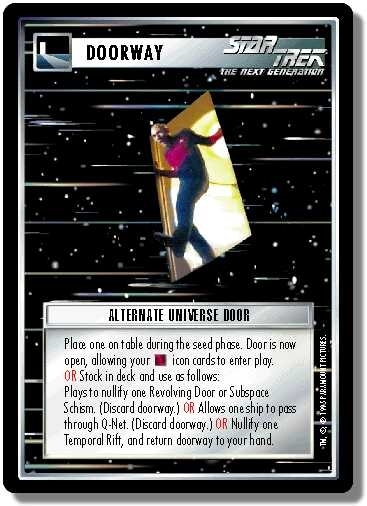 Also see here for all trade lists with any card fom "Alternate Universe".